A great snack for eating on-the-go! In a food processor blend oats until fine. Add flaxseed, coconut, pecans, dates, carrot, vanilla, cinnamon, nutmeg and cloves. Process until forms a thick paste. Scraping down the sides with a spatula as needed. 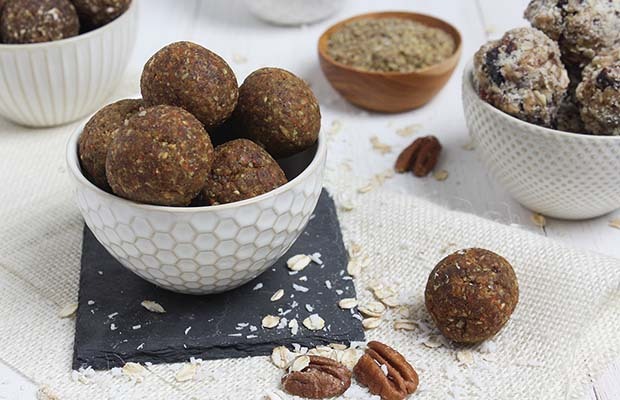 Take 1 Tbsp (15 mL) of mixture, form into balls and roll in pecans. Chill for 30 minutes and serve. Makes 20 energy balls. Note: Store, covered, in the refrigerator for up to 5 days.